...to create a well sealed finish. completely seals off your entertainment area. to create that cosy feel. Easy to use Cafe Blinds with side channels. Comes with crank or motorised options. and easily raised when not in use. An economical and highly functional option. for providing protection with unobstructed views. Cafe blinds, also know as bistro blinds, are the perfect way to turn any outdoor areas into fantastic all weather entertainment areas. Great for patios and pergolas, our range is custom-made and made locally. If you want a feeling of space, we have a selection of clear outdoor PVC Blinds that can protect you from the elements while allowing you to see through them unimpeded. Our cafe blinds in Melbourne are available in multiple control options including crank, spring and motorised, with a choice of side channels or tie-downs. 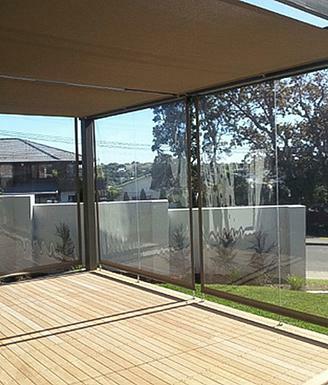 Our alfresco and cafe blinds are made using the latest laser cutting and PVC welding to produce a superior product. Our selection is available in a range of opacities to allow you to select the amount of light you want to allow in. Because of the quality of the materials we use, your blinds will never become yellow or discoloured. Our outdoor blinds are made with marine grade PVC, and are available in thicknesses of 0.75mm and 1mm. Made to last, and at affordable prices, our outdoor blinds in Melbourne are a great choice for any outdoor entertainment areas. Our Alfresco/Cafe Blinds are made using the very best components and high marine grade PVC. We offer a 5 year warranty for our clear pvc blind range as testament to our quality. Our blinds are made right here in Melbourne to strict Australian Standards using the latest in outdoor blinds manufacturing. It's also good to know you're supporting the local economy. Our PVC Blinds are cut using the latest technology laser cutters and fabric welders. This delivers a superior blind with well sealed joins and and cleaner edges. Our Cafe Blinds are made using only the very best Japanese Marine Grade PVC. This gives a clearer looking and longer lasting PVC Cafe Blind. Our range is made with the very best heavy duty tubes and components. The PVC used in our Alfresco Blinds is made to last.